So I had a business meeting at the mall today and of course it being 100 degrees outside I wore my fun top from SizesToFit.com and my Old Navy Plus torn white jean Capri's - LOVE THEM - problem however, they were falling off! And, they were fresh out of the dryer....so I knew I could pop into Lane Bryant and get a new pair of pants easy...but I didn't know I'd score these totally fabulous fitting white jean Capri's for only $19.99!! They regularly go for $49.50. Seriously, run into your LB and snag a pair of these capris, they are fantastic! Lucky me! So I quickly grabbed my size 28, headed to the room, 2 minutes later bought them and put them on to jet out the door. I truly do love Lane Bryant, especially for the bras and pants. If I had more time I definitely would have taken advantage of the buy 2 bras get 2 free deal! I have to say how great the staff was at the Lloyd Center Lane Bryant in Portland, OR...I even snapped a shot with her :). She rocked. Totally fabulous Kelsey Powell of LB, she rocked. love this blog, but i don't dig the white on white. you need a little contrast with that cute top. I love this - so bright, cheerful and summery. 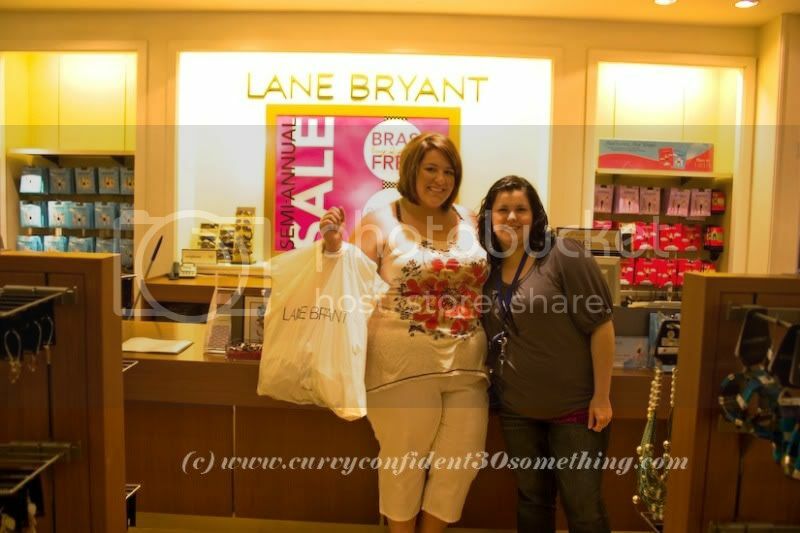 I think Lane Bryant did you proud!! !